Typical rework rates exceed 60% of a developer’s time - How much do your developers dedicate to repairing source code flaws? Is increased effort required to maintain difficult to manage code or enhance rigid applications? Measuring software quality is important to ensuring an implemented or released program is secure, does not contain rule violations, and is not wasteful of time or resources. Software quality attributes such as complexity are important because they allow organizations to identify violations or flaws within a codebase prior to implementation or release. By measuring software quality attributes, organizations are able to identify problems up front and immediately implement improvement efforts to avoid the need to repair costly, time-consuming issues. As an application grows in complexity, it becomes increasingly difficult to maintain. Development teams implementing defective, vulnerable code into a multi-tier infrastructure are creating the potential for significant problems. Organizations need the right tools for measuring software quality assurance and size or complexity metrics are an applicable solution. By using these metrics before implementation or to assess existing software, your organization will be able to identify problems at any point in the development life cycle. The result is secure software that meets architecture standards and is easy to maintain or enhance. Automated analysis solutions may be utilized for measuring software quality assurance to pinpoint the exact lines of code causing the problem in less time. Software quality is not an intrinsic property of code: the exact piece of code can be excellent in software quality or highly dangerous depending on the context in which it operates. Analyzing the software quality of applications in the context of the numerous interconnections with other code, databases, middleware, and APIs is monstrously complex. It can only be accomplished by automating the analysis of the inner structure of all components of business software and evaluating their interactions in the context of the entire application. Organizations need a way to quickly perform software quality analysis to identify vulnerabilities. Automated software quality analysis is an objective, repeatable approach to identifying vulnerabilities in code - whether a single component or massive, multi-tiered application. An effective process ensures that potential risks are identified and/or resolved prior to release. 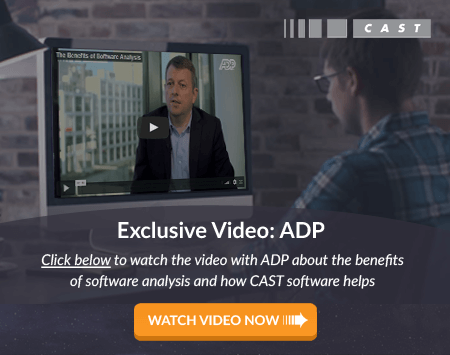 The CAST Application Intelligence Platform (AIP) is the only enterprise-grade software quality assessment and performance measurement solution available in the market today. The CAST solution inspects source code, identifies and tracks quality issues, and provides the data to monitor development performance. CAST can read, analyze, and semantically understand most kinds of source code, including scripting and interface languages, 3GLs, 4GLs, and web and mainframe technologies, across all layers of an application (UI, logic, and data). By analyzing all tiers of a complex application, CAST measures quality and adherence to architectural and coding standards, while providing visual specification models.